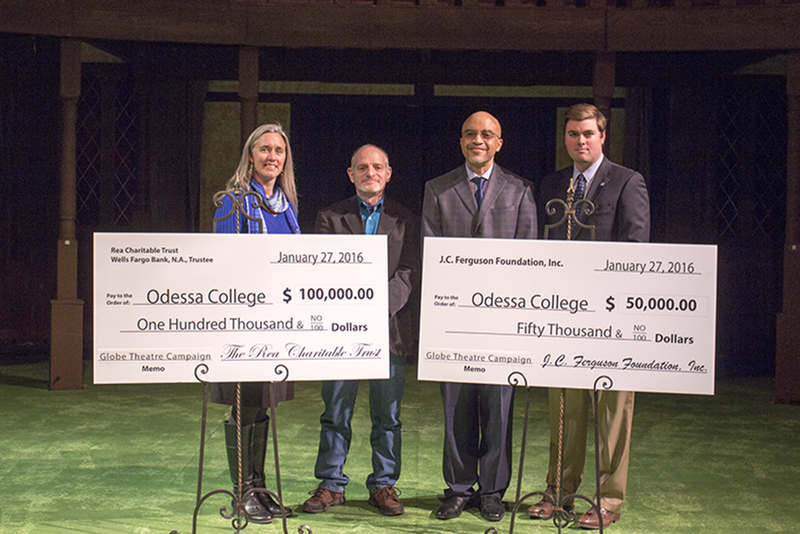 ODESSA (Jan. 27, 2015) – Odessa College announced the receipt of two large donations to be used for modernization and maintenance updates for the Globe Theatre. The $100,000 donation from the Rea Family Charitable Trust and the $50,000 donation from the JC Ferguson Foundation were presented to Odessa College at a press conference held Wednesday, January 27 at the Globe Theater. In 2015, Odessa College assumed responsibility for the Globe Theatre facility and conducted an assessment to determine what improvements and upgrades would be needed. Based on the findings, school officials developed a three-phase plan for the project. The Globe modernization project is expected to begin in May 2016. Phase I will include aesthetics and safety upgrades such as new seats and carpet. Phase II will address backstage and technical upgrades, and Phase III will encompass exterior beautification. The generous contributions from the Rea and Ferguson foundations will be part of the Odessa College Globe Theatre Campaign fund, which currently totals $239,000. The fundraising campaign goal for updates to the theatre is $750,000. Anyone interested in contributing to the campaign may contact the Odessa College Foundation Office, 432-335-6646.